I was born and raised in East Texas, attended college at Stephen F. Austin State University and the East Texas Police Academy, settling on a career in Law Enforcement. I was devastated by an 85lb weight gain with my first pregnancy. 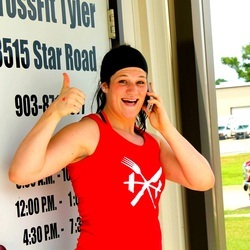 Until I found CrossFit and in particular the amazing community at CrossFit Tyler. They literally helped me get my life back! I began coaching CrossFit in 2012. 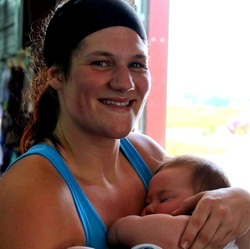 I am now the mother of two precious boys, and am proud to have continued coaching CrossFit and training through my second pregnancy. 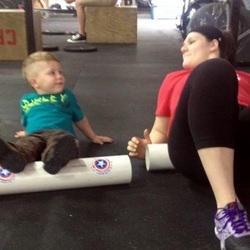 I CrossFit because it keeps me sane, healthy and able to keep up with my two active little boys! CrossFit enables me to smash barriers and achieve some of the most challenging objectives out there - it is one of the ultimates in my personal betterment. I coach because I know how intimidating personal change can be. I want to see people reach and surpass their goals. If I can help in any way, I'm all over it! To me, this is such a positive, gratifying purpose. Coaching keeps me motivated in my own training as well and allows me to constantly review the foundations of CrossFit. I learn something new every day! I love my life and couldn't be happier with my new vocation as a coach. 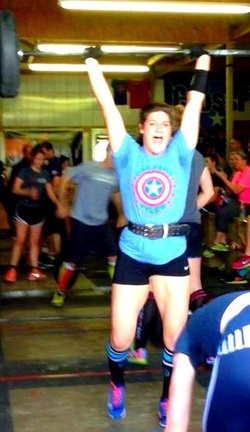 You'll catch me smiling when I'm Olympic Lifting and doing Kettlebells. I am challenged by L-Sit holds. When I eat what I want, it's dessert! Chocolate and Tiramusu.